East Meets West: Foreign box-office receipts are proportionately bigger today, but they're nothing new. Movie-goers in other countries were just as wild about Westerns filmed at Melody Ranch and elsewhere in the Santa Clarita Valley, both before and after World War II, as were domestic audiences. 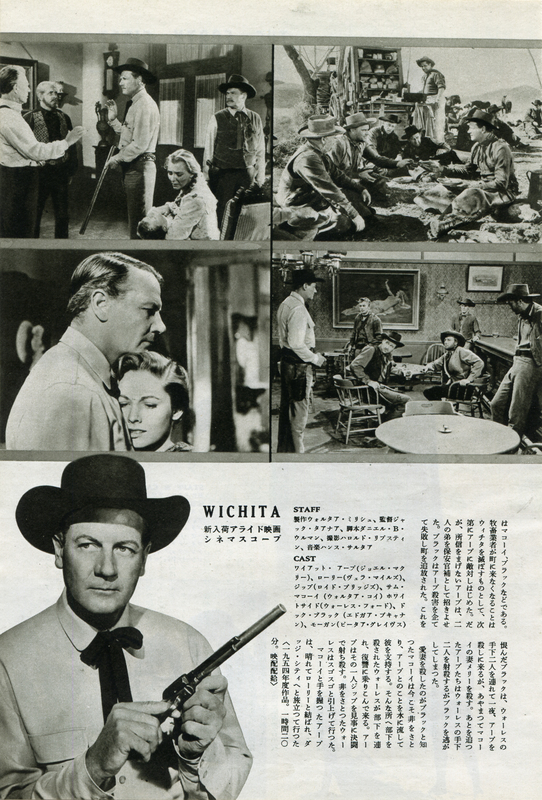 Two-page spread (each page 7x10 inches) from an unidentified Japanese magazine, 1957, relating to the 1955 motion picture "Wichita," showing scenes shot at Gene Autry's Melody Ranch in Placerita Canyon. Joel McCrea and Vera Miles star. LW2621a: 19200 dpi jpeg from original magazine page purchased 2014 by Leon Worden from a dealer in Kobe, Japan.